Overview A Basic lawn care program for the budget conscious homeowner. 3 applications of Turf King's Fertilizer* and full season Weed Management treatments. SPRING SUMMER and FALL FERTILIZER: Turf King's exclusive fortified organic Fertilizer blend - 75% slow release. Formulated with 6 different nitrogen sources to give long lasting nutrient value to your lawn for up to 20 weeks and more. Includes Kelp Supplement for additional organic bio-stimulants. Keep your lawn healthy and thick to crowd out weeds. such as dandelions, plantain and others. Treatments are applied throughout the season to minimize unwanted weeds in your lawn. Normally provided in 5 seasonal visits. Other treatments and applications can be added to this basic program to enhance your lawn with such things as Core aeration, Chinch Bug protection, White Grub Treatment, Crabgrass Reduction. * Fertilizer applications will vary- in a recent letter/flyer - a mistake was made in the computer that calculated prices- resulting in prices that may be up to 50% lower than they were supposed to be. We apologize for any inconvenience or confusion. We may adjust the fertilizer applications for those particular program applications. 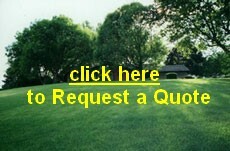 Sample Price for a lawn up to 3,000 sq ft.
*Lawns under 3,000 sq ft. may be priced slightly lower. Larger lawns will cost more.